This report summarises the results of the Ngor Commitment monitoring carried out by 39 countries. The purpose of the report is to provide a baseline three years on from the Ngor Declaration on Sanitation and Hygiene. It provides an overview of the vision and commitments themselves and the actions required to make progress. The monitoring process captures the Ngor Commitments both in terms of whether the building blocks of the enabling environment are in place, and subsequently captures progress against country-specific targets. The overall results of the Ngor Commitment Monitoring show that the enabling environment for sanitation and hygiene across Africa is currently uneven. Progress in the enabling environment for leadership and coordination, and government-led monitoring systems, is not matched for commitments such as waste management, eliminating inequality, and establishing budgets. Unless addressed, the areas of the enabling environment that are lagging behind will act as a drag on the entire sector and hinder realisation of the Ngor vision. Across Africa there has been good progress against the commitment to establish leadership and coordination structures. This is a key area that drives progress in the sector. The commitment to eliminate inequalities in access and use, and to establish budgets for sanitation and hygiene remain critical bottlenecks which threaten to undermine progress in Africa. Both have been identified as necessary for enabling and accelerating progress to SDG 6 globally. 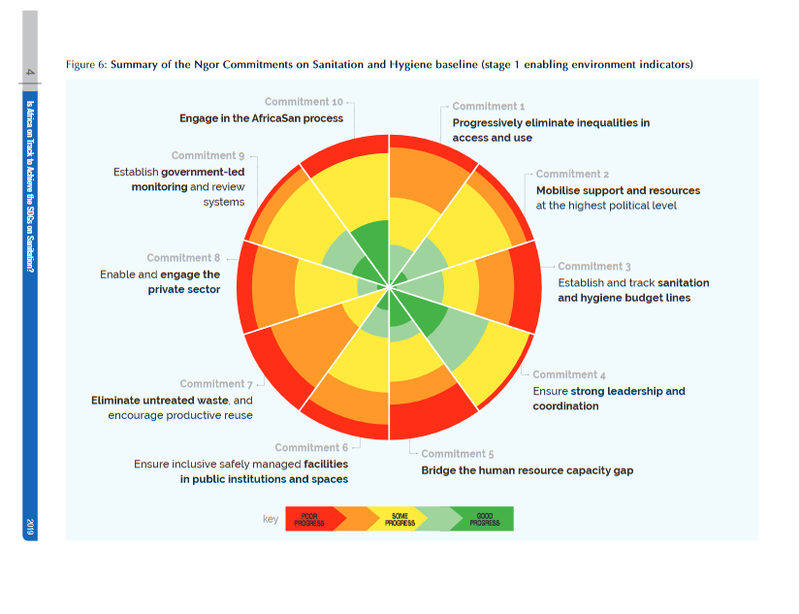 Cognisant that not all countries progress at the same rate, the Ngor Commitments monitoring process was designed to be nuanced and allow countries to set their own priorities for working towards each commitment. The second stage of monitoring indicators measures whether each country is on track to meet its own national targets. For five out of 7 of the commitments linked to stage two indicators, more than half of countries have made insufficient progress in establishing the enabling environment, to be able to monitor progress against country targets. No countries have made enough progress in establishing the enabling environment for eliminating untreated waste to be able to report against country targets. This pattern will change in the future as countries strengthen the enabling environment, and targets and tracking systems against which to measure progress are established.